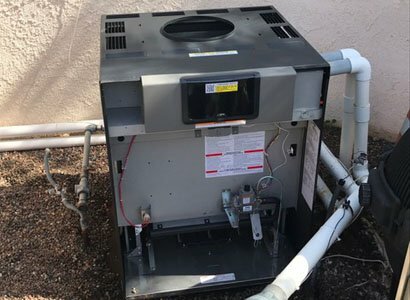 We were called out to perform a pool heater repair in Carlsbad, CA due to it was not heating. As with all pool heater repairs, we always need to do a complete diagnostic or service call. Pool heater service calls are necessary to determine the exact problem and if the heater is worth repairing. After thoroughly diagnosing and troubleshooting, the pool heater repair we determined there were too many issues. After talking to the customer and providing written estimates for the needed repairs, they opted to replace. 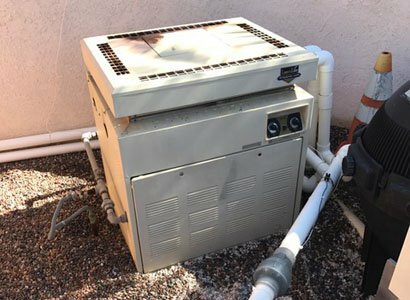 Along with the high cost of the pool heater repair, the age of the heater did not make repairing a good investment. We are always happy to repair a pool heater though not always is it a good idea. After discussing the new pool heater installation options with the customer, they trusted our choice of the new pool heater. A new Raypak 406A pool heater is the best pool heater if there is access and the space required. First, we needed to remove the old Teledyne Laars (Laars Lite Pool Heater) to make room for the new one. Once there is access, we start to install the Raypak pool heater for this Carlsbad swimming pool and spa customer. Installing the new plumbing to the inlet and outlet to the new pool heater. Wiring the Raypak pool heater correctly to ensure there are no future electrical concerns. Making sure the gas line is installed properly and that there are no gas leaks. And it is very important to install your pool heater on a raised pad to avoid pool heater corrosion. This new Raypak pool heater was installed in Carlsbad, Ca and the old heater was disposed. 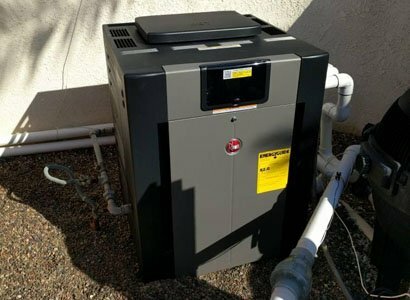 With all pool heater installation projects in Carlsbad or anywhere in San Diego, we always remove and dispose of the old pool heater. If you live in the Carlsbad, CA area or any other area of San Diego County we can help. Thinking you may have a bad pool heater or need a pool heater repair? 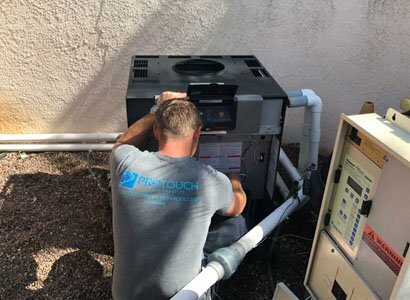 Have us out to perform a professional diagnosis of the pool heater and provide you with all of your options for a resolution.